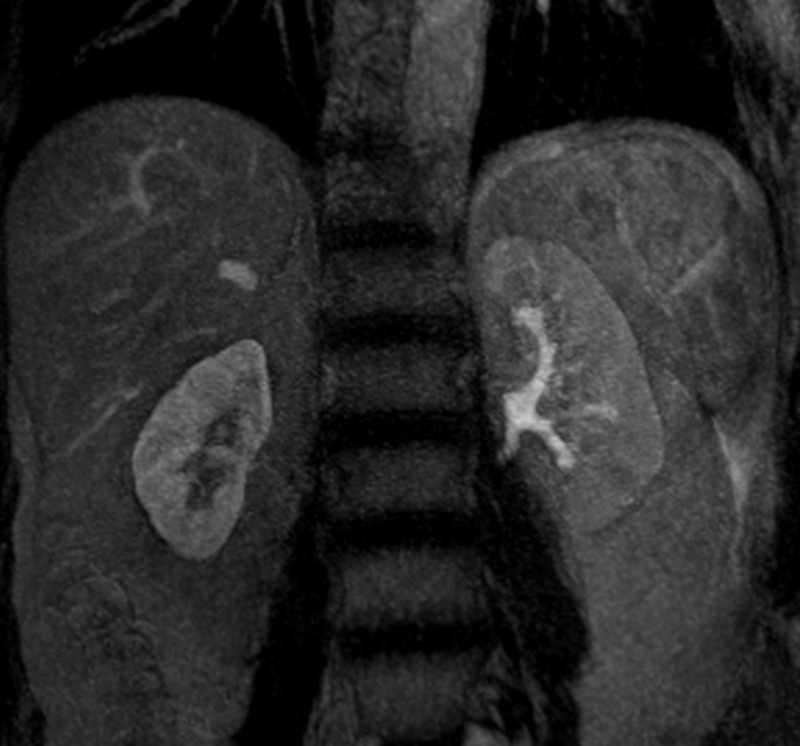 This 64-year-old man presented with an increased serum creatinine level (2.77 mg/dL) and significant asymmetry of renal size (reduced on the right) on ultrasound. The past medical history was pertinent for prior stenting of the right renal artery. Ischemic nephropathy due to high-grade renal artery stenosis. 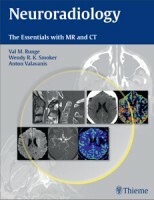 Scans were acquired at 1.5 T on a Siemens Avanto system, using one body matrix coil in combination with the spine coil. 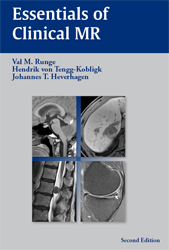 Renal perfusion was measured using a saturation-recovery TurboFLASH sequence (TR/TE 350/0.98 msec, voxel size 2.3×2.3×8 mm3, temporal resolution 4 slices/sec) after the bolus injection of 2 ml of a 1 M gadolinium chelate formulation. The total acquisition time was 3:50 min. 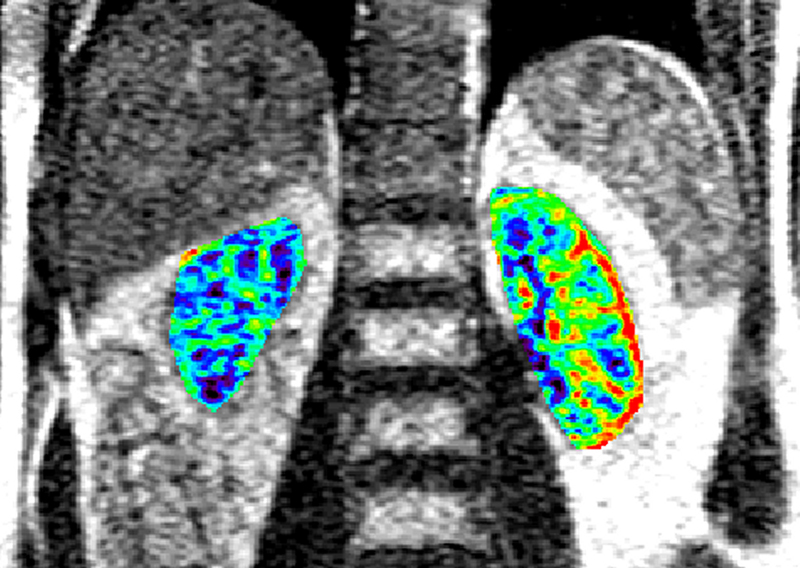 From the perfusion data, quantitative perfusion values were calculated offline using a 2-compartment model. For the MRA, bolus timing was used, employing 1 ml of contrast at 1.5 ml/sec followed by a 25 ml saline chaser. For the MRA-exam itself, 7 ml of a 1 M gadolinium chelate was administered at a rate of 1.5 ml/sec. This was followed by a 25 ml saline flush, administered at the same rate. The scan parameters of the 3D-FLASH (fast low angle shot) sequence were TR/TE = 2.6/1.1 ms, with a voxel size of 1.0 x 1.2 x 1.1 mm3 and a scan time of 19 seconds (acquired during breath-holding). Parallel imaging was utilized (GRAPPA), with an acceleration factor of 2. 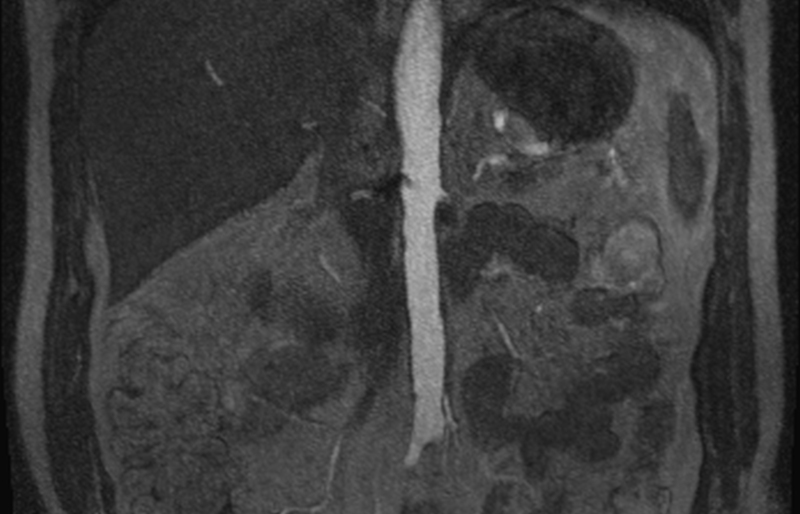 In the thin MIP of the arterial MRA (A, B), a stent in the proximal right renal artery and a markedly reduced lumen of the right renal artery can be seen. 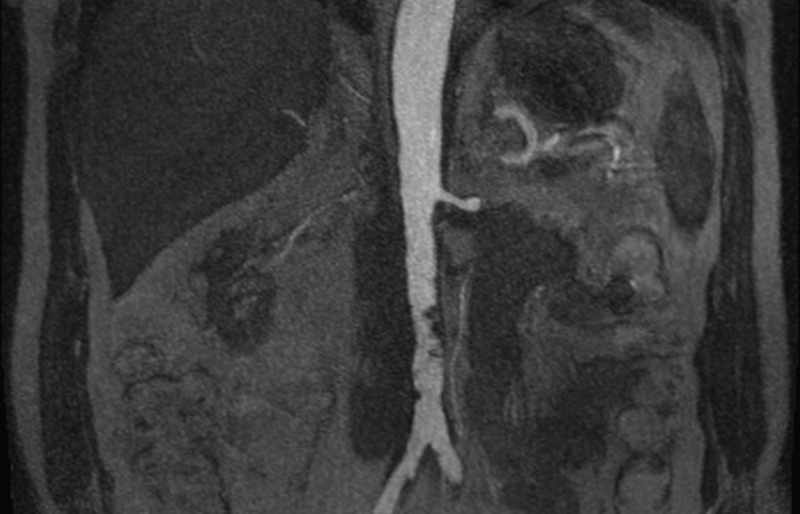 The left renal artery, which is only partly depicted, demonstrates a proximal intermediate grade stenosis. In the venous MRA source image (C), a marked size difference between the cirrhotic right and the normal appearing left kidney is seen. In addition to the size difference, the right kidney does not demonstrate any excretion, with persistent enhancement due to retention of the contrast agent. These findings are reinforced by the color-coded parameter map (D), which demonstrates lower mean perfusion values for the right kidney, which only contributes 15% to the overall glomerular filtration rate.